Welcome on board the Discovery Express! The year is 1937 and a conundrum is afoot: a professor on the verge of a brilliant discovery has disappeared. Can you help to solve the clues on this time-travelling adventure and track down the missing scientist? On your voyage, you'll travel the world, see some of the most important moments in the history of transport, meet the most brilliant engineers of all time, and ultimately unveil the design of the world's first jet engine! 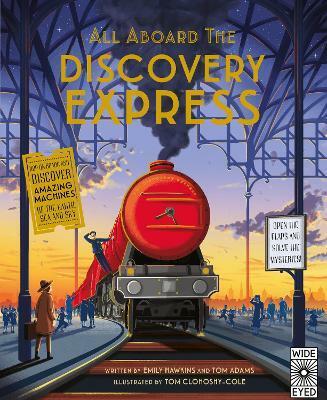 With clues to solve on every page, this interactive lift-flap adventure is sure to spark the imaginations of aspiring scientists and engineers everywhere, as you travel back in time to discover the history of transport. Tom Adams is an award-winning television producer and author. He was born in Yorkshire but now lives in Kent, UK. With a science background, he was inspired to turn his hand to writing children's books once his eldest son, then 5, started asking questions about how the world worked. He won the Society of Authors/ ALCS Award for Educational Writing for his book Molecule Mayhem. Tom Clohosy Cole is a London-based freelance illustrator, designer & animator. He is the illustrator of All Aboard the Discovery Express, Destination: Planet Earth and Destination: Space, which was shortlisted for the Blue Peter Book Awards 2017.